Sean Baker has worked as a director, writer and editor since 2000 in film and television. His new film The Florida Project was originally meant to be made prior to 2015 but because of lack of funding it didn’t go into production. Instead he made the micro-budgeted film Tangerine which when it was released was critically acclaimed. It was set in Hollywood on Christmas Eve and featured a great array of performances especially by its protagonists Kitana Kiki Rodriquez as Sin-Dee Rella and Mya Taylor as Alexandra. Both actresses were nominated for several awards and were in 2016 very close to being nominated for Academy Awards. The critical success of Tangerine helped finance the budget for The Florida Project. It is more commercial than Tangerine but it still retains its elements of style, humour and strength of performances. One of the things most written about Tangerine was that it had been filmed using iPhone 5s. That form of filmmaking is also used at one point in this new film as well. 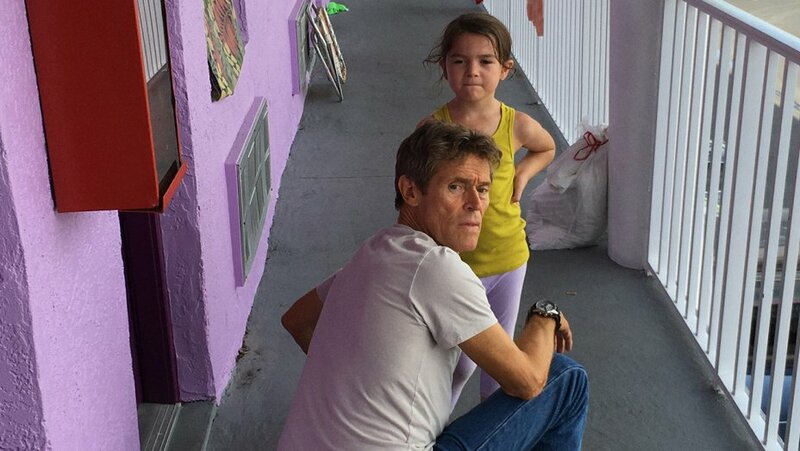 The Florida Project was originally the idea of Baker’s co-writer Chris Bergoch who became aware of the vast amount of people who due to high rent costs are forced to live in low rent motels throughout America. The film was shot on location at one such motel complex located near the Disney World Resort in Florida. In the film it is given the fictional name of The Magic Castle. The events of the summer are depicted through the eyes of the film’s six year old protagonist Moonee (Brooklyn Prince) who lives at the motel with her mother Halley (Bria Vinaite). The film focuses on how Moonee spends her days with her friends Scooty (Christopher Rivera) and Jancey (Valeria Cotto). Baker has said in interviews that the depiction of the children in the film was greatly influenced by the Little Rascals characters made famous since the 1930s in Hal Roach’s Our Gang series of films. In the early scenes of the film Halley is depicted as a mother who takes limited responsibility for the various misdemeanours and pranks that her daughter and her friends get up to during her day. Many of these are innocent but as the story progresses some have more serious consequences. Willem Defoe plays the motel’s manager Bobby who is also a sort of guardian or father figure to the people living long term in the motel. The film features one of his best performances to date. He never overshadows the fact that the film is ultimately Moonee and Halley’s story. His exasperation of the various things that Moonee does is often depicted as light hearted but is also one of dismay for the reality of their lives. Audiences may also share some of his feelings towards the motels inhabitants but no one will be indifferent. As Halley is unemployed the film depicts how she tries to earn money for rent and food. The motel rooms are simply bedrooms and bathrooms so they live in very small spaces and on a diet of junk food. As the story is depicted primarily through Moonee’s point of view, Halley’s daily life is purposefully not always fully presented. Baker very effectively parallels the carefree existence of Moonee’s childhood with Halley’s mix of indifference and struggles. Bria Vinaite was discovered by Baker through her Instagram posts and she had no previous acting experience. It was a gamble in casting that has paid off for Baker as Vinaite depicts Halley as complex and real as Kitana Kiki Rodriquez was as Sin-Dee Rella in Tangerine. Baker had a full script by the end of The Florida Project’s shoot but its production also featured a lot of improvisation which can be seen on screen. Baker is also a great editor and working with his cinematographer Alexis Zabe he frames scenes beautifully. Hand painted advertisements, ice cream and souvenir shops and overhead fireworks all add to the world of colour and light that Moonee and her friends all have to create for themselves. The entire film is a series of well-structured juxtapositions. Helicopters fly overhead bringing tourists to the nearby Disney World resort as the people in the motel live one missed rent payment away from homelessness. The film is a continuous social commentary but it never lectures. It simply presents their stories. The characters are unapologetically who they are and are embodied with as much strength as they have weakness.